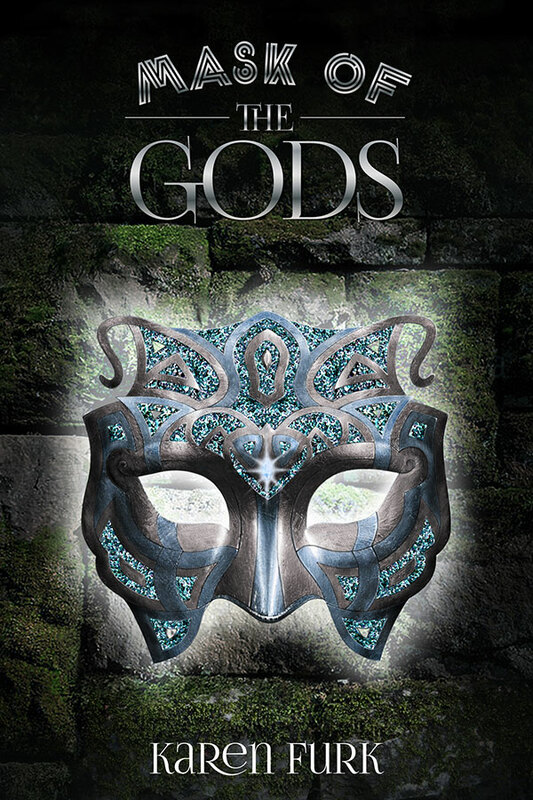 The debut novel, Mask of the Gods from fantasy author Karen Furk, is now available. To give you a little taster of what’s in store for you, here is the Mask of the Gods book cover. Written during NaNoWriMo 2015, Mask of the Gods sits alongside the storm trilogy as a separate, but connected book. All the key characters make an appearance. You also need to read this which gives more background to the underlying fantasy premise that the secondary story running through Mask of the Gods is based on. MASK OF THE GODS IS NOW AVAILABLE! Keep scrolling to see a preview of the first two chapters. Warning lights activated in Haydan’s snug, lending the interior of the cocoon he slept in an eerie blue glow. Reflecting off the white padded walls, the light was bright enough to wake him immediately from his slumber. The calm ambience shattered, Haydan’s eyes snapped open and he processed the level of threat. On his wrist his altera started thrumming, warning him to be on his guard. Vibrations rippled down his right arm in huge waves. The molten surface of the altera shifted violently, as swirling mist surfaced from the depths in huge plumes, adding to his unease. The wide band sat above Haydan’s right wrist bone. Not only was it the source of his powers, but the swirling underside was home to his soul. On Storm Lands as in the majority of other realms, it could detect danger long before he was aware of a problem and that morning something had sent it into a state of high alert. Within moments Haydan was up. Dressed in a red top to complement his blond curly hair, dark trousers and sturdy boots, he rushed towards the door in his nine-year-old form. Since he didn’t know what was happening, avoiding using his powers to make himself appear older made sense. Stumbling out of his snug, Haydan peered around bleary eyed, feeling like a creature emerging from hibernation. It was early morning; usually the time when un-bonded storm riders recovered from their previous evening’s training – but not today. The surrounding forest was a hive of activity. Diego, Haydan’s father strode past. Fully dressed in storm rider battle attire, he moved with purpose. For some inexplicable reason Diego never discussed age, but he estimated his father to be around thirty years old. With his dark hair, roguish green eyes and formidable expression he was an image of imposing, furious male. Haydan’s mouth dropped open in awe. Diego’s military styled coat looked striking and under that he wore a leather tunic fastened by buckles, no doubt hiding body armour beneath. Dark trousers were adorned with additional leather padding, over his groin, knees and calves. His boots were the lighter variety, allowing him more manoeuvrability. Following a woodland path, they left the snug area, stepping through the plants that investigated new arrivals to the planet, blocking access to anyone uninvited. Even the plants rapidly drew out of Diego’s way as he moved with purpose, the tendrils pulling away as though afraid to touch him. Diego came to a halt, waiting as Haydan stood still permitting the brief exploration. Cool, soft fronds brushed his skin, sliding around his altera, exploring it in a manner that felt intimate. Haydan waited for the fronds to reach the underside of the altera anchored to his right wrist. Their exploration slowed at that point, unfurling slowly across the swirling base as though fascinated by him. Haydan had walked through the barrier countless times, but it never fully accepted his presence. Diego on the other hand could stride through without a frond touching him. Haydan could never decide if the plants avoided Diego because he was a lone wolf and a bit of an unknown, or whether it was due to his elder powers, but he definitely held a unique ability to clear the foliage without being stopped. Perhaps when Haydan bonded with Maya and his own abilities developed fully, it would finally permit him free access; or maybe he would have to accept that elders like his father would always be permitted unrestricted access. Another rider rushed towards them from the direction they were heading. The man seemed oblivious to the plants. He continued moving whilst brushing the fronds aside as he lowered his head in greeting. Given the leisurely manner in which the plants explored Haydan, the speed with which they attacked the other storm rider proved alarming. The man vanished under the writhing foliage with a strangled yelp as the plants assessed his level of threat. Clearly the protective boundary of foliage around the snugs was also on high alert that morning. Even overconfident storm riders were not protected from a thorough intruder investigation. “He will learn.” Diego quirked an eyebrow. The glint in his eyes and tiny uplift to the edge of his mouth suggested he found the predicament of the other man amusing. Released by the plants, the man muttered as he kept his head lowered. Brushing himself down, he stumbled off towards the snugs. Haydan fought back the urge to laugh at the other rider’s fix. Humiliation in front of an elder never felt good. He had experienced the same feeling in front of his father many times himself, usually when he was in some sort of trouble. Diego returned his attention to Haydan and his smirk vanished as he noticed the fronds still wrapped around Haydan’s altera arm. “Let the boy go. He’s not a threat.” Diego’s sharp tone had the desired effect, the fronds released and retracted from Haydan’s arm. Diego’s intense stare reminded Haydan that his father expected a response to his earlier question. “Maya likes my younger form and I find it more appropriate when I’m near her. I spend a lot of time with her. I don’t do it to annoy you specifically.” Haydan said as they walked up to the arrival area, which was an open grassy section of land that overlooked the snugs hidden further down the hillside. Haydan wasn’t aware anyone new had arrived. Diego had a knack for making his feelings very clear and a way of making Haydan feel he should comply with his father’s wishes. After a moment Haydan switched into his older form, more like that of a twenty-year-old male, with darker spiky hair, filling out and moving to a height on a level with Diego. The move appeared to calm Diego, who fidgeted, maybe finding his battle attire uncomfortable. That in itself was strange, Diego rarely fidgeted. He usually moved confidently, with purpose; something was wrong and whatever it was, it clearly bothered Diego. A moment later, Diego spun around as something moved towards them from the surrounding trees. It didn’t have a form as such; it distorted the air as it moved out from the trees. Or perhaps it pulled the air towards it as it moved, Haydan couldn’t decide which. Surprised by the dismissal, Haydan opened his mouth to object as Diego threw his right arm out, sending a huge blast of energy towards him. His nostrils filled with the scent of warm cinnamon. His skin tingled as the magic his father threw out shot towards him, engulfing him. It proved too quick for Haydan to dodge. He felt his body being dragged away from Storm Lands. Spray brushed his face and thunder rumbled, followed by a flash of searing lightning, which was his father’s calling card. His father’s control of the weather even within his own storm cloud proved as fascinating as the man himself. By the time Haydan reached the location his father had chosen to abandon him in, he knew whatever had attacked Storm Lands was dangerous and powerful. There was no other explanation for an elder to dismiss his own un-bonded son in such a manner from his home world. Whatever Haydan had landed in face first was warm, soft and the surroundings dark. The scent of freshly laundered bedding overwhelmed him. He flipped onto his back as his gaze met with large, wide brown eyes dancing with terror inches from his face and a thick mop of dark hair that emerged from the duvet next to him. Recognition faintly flashed across Maya’s delicate features before she fell out of the bed, with a strangled yelp and loud thump, taking the duvet with her. On the bedside table, a glass tipped over spilling water everywhere as it clattered and tumbled to the floor. Pounding feet on the stairs warned Haydan of the impending invasion of his privacy. Maya’s mother, Katherine, threw the bedroom door wide open. The light snapped on, blinding Haydan, who squinted as he took in Katherine’s shocked expression. Her long auburn tresses were flung all over the place and she had barely managed to fasten her dressing gown. Isaac, Maya’s stepfather, rushed into the room behind Katherine. Isaac’s expression was one of absolute bewilderment, which was nothing out of the ordinary around Haydan. Unused to Maya and Haydan’s unique relationship, Isaac found the odd things that happened around Maya weird, whereas Katherine was much more accepting. Haydan couldn’t help himself any longer. His father had done that deliberately. He gave up biting down on his bottom lip. Throwing his head back onto the pillow, he erupted into laughter. In the nearby undergrowth a woman emerged. Glancing around, she moved towards the large oak framed house, pausing as something brought her to a halt. With a frown, she raised her hand, puzzling as she tapped an invisible bubble that surrounded the property with her fingertip. How unusual to find that level of security around her grandson’s chosen one and warrior. Although the fact that Haydan’s chosen one and warrior lived under the same roof as each other was in itself strange. Haydan was born at the same time as his females, to different parents and was therefore the same age as them. Arianna was his designated warrior, Maya his chosen one. Usually warrior and chosen one rarely came into contact with each other, but in Katherine’s household, the usual rules blended with an alarming fluidity. Lavinia hadn’t met Katherine yet, but could already tell she would like the woman immensely. Lavinia smiled, her silvery-green eyes dancing with delight as she stepped back and released a gentle flow of energy from her hand. Her altera flared at the power surge, the surface rippling and glowing gently from within. Designed to guard from unwanted intruders, the shield would recognise her biological connection to Haydan and permit her access. It was a powerful magical ward that few could create, making her wonder who had set it. Although not an elder, she could easily recognise magic used by their kind and it wasn’t Diego’s handiwork. A moment later, her walk to the front door of the property resumed, unhindered by whatever halted her progress previously. The property Lavinia approached was large and spacious with a sleek, silver car on the driveway. Her people had no use for such displays of flamboyance, but rather like in the realm of the dark fae, the size of a property on Earth usually indicated wealth and status. It appeared Katherine, Maya’s mother, had done well for herself in human terms. That didn’t surprise her as much as Katherine’s choice of current mate. But then it was none of Lavinia’s business, although she did wonder what Haydan made of it, because she doubted he would get on with Isaac. A loud female scream pierced the air, punctuated a moment later by a male yelp of what sounded like surprise. Lavinia smiled, she definitely had the correct house. A moment later, Arianna opened the front door. Shrugging into a zip up fleece over her pyjamas, then brushing her light brown hair behind her ears, Haydan’s warrior rushed across with a delighted grin illuminating her pretty features. Finding Arianna so casually dressed and in her younger form, that of a nine-year-old human child, felt strange. On Storm Lands, warriors often took their older form around their storm rider and always dressed in warrior attire. Unsurprisingly, Arianna looked delighted by Lavinia’s presence. Right now Haydan had no idea Lavinia was back and Arianna would like knowing something he didn’t. Lavinia chuckled softly. “No, neither my son nor grandson knows I’m back. I figured I would surprise them, although I think Haydan’s surprised Maya.” She had missed both her boys whilst away and despite the fact that Haydan’s existence made her feel old, she adored him. Tallin, Haydan’s grandfather would be immensely proud of him too. Haydan looked remarkably like Tallin, with many of his traits. The reminder always hurt deep down to her soul, which ached in response. The question didn’t surprise Lavinia. In order to protect their storm rider, warriors always knew when their home world’s security system activated. Lavinia studied the large, oak framed house behind her. “You seem comfortable. Your father must be a successful and wealthy man.” One of their chosen ones being drawn to such a powerful male didn’t concern her. Isaac being human however was odd. No doubt he was strong-willed and determined, much like their own kind. She wondered what Diego, as elder, thought of one of their chosen one females finding and falling in love with a human. Given their people were re-born, Diego perhaps considered a human lifetime with one of their chosen one souls insignificant in the grand scheme of things. Or maybe he knew something she didn’t. The thought made Lavinia’s fists clench in response. She was immensely proud of Diego even though her son achieving elder status irritated her in equal measure. He was born an elder with his additional powers bestowed on him, allowing him to better defend their home world and his powers were further amplified by his combined elven and fae heritage. His arrival had massively inconvenienced her and her relationship with Tallin. She was more than capable of being elder, so why she hadn’t been chosen for the honour bestowed on few, was beyond her. Haydan without a doubt would hate the challenge to his authority from Isaac. Humans would never understand the dynamics of a storm rider’s relationship with their chosen one and warrior, which was bizarre given that humans talked of soulmates as though they understood what it meant. Arianna chuckled, throwing her hair over her shoulder. “Does this mean we’re going to be going on some sort of adventure?” Lavinia frequently disappeared on off world trips that were always shrouded in mystery; or maybe she liked to keep them a secret to enchance the air of intrigue that followed her about. Arianna bit down hard on her bottom lip. Given her status as Haydan’s warrior and protector she delighted in any excuse to off world. Any hint of adventure always fired her up and the thrill of knowing adventure had come calling that morning was almost too much excitement to bear. Arianna led Lavinia into the hallway. It felt odd to be bringing another storm rider into her Earth home. “Haydan’s good at focusing when he needs to,” Arianna said. Shuffling and movement upstairs indicated the earlier incident with Haydan and Maya had disturbed the entire house. Arianna could hear her father muttering at Katherine asking him to change Maddison, her baby sister. “Where are we going, Lavinia? Oh please tell me it’s somewhere new?” Ignoring Lavinia’s glare of disapproval, Arianna bounced around as they moved into the large lounge. Bifold doors at the end opened onto a decked area, the balustrades providing a tantalising glimpse of the garden and loch beyond, which was currently shrouded in drifting mist. Lavinia’s eyes glinted with mischief. Arianna was actually going to get some information out of her about her adventures. She would have to make it quick though as Haydan would be downstairs soon enough. forming a containment bubble of powerful energy, the demon roared in fury, switching into its demon form, all black smoke, red fire and blazing red eyes. When that failed to intimidate, it changed into a male form. Tall with long blond hair, a muscular chest and dark eyes, nothing about its change of form fooled Diego. It oozed demonic hatred towards him as it glared at him, probably wishing him as much harm as he wished it. The figure hissed before changing back into its demon form and hurling itself against the barrier. Diego focused his powers, restricting the creature’s prison. It would learn fast enough that he wasn’t to be messed with. The more it struggled, the more it would find itself restricted within his energy field. Once it ran out of room, the barrier would start hurting. As far as Diego was concerned, the more pain the creature felt the better. “That’s not a smart move. Now I’m running out of patience, so let’s establish some ground rules,” Diego said, finding the lack of communication from the demon irritating. Power released from his hand as his altera flared. Energy filled the air like glowing mist as it drifted into the soul demon’s prison. The creature reared up and away. Creatures of the light and dark repelled each other’s energy, so it was inevitable that the creature hated the contact. Diego grimaced trying to disguise how much his magic touching the creature repulsed him. He tentatively toyed with it, drifting his power around the demon before tightening his hold to constrict the cell that surrounded it. A loud wail of terror confirmed his prisoner welcomed the contact even less. Prolonged contact with evil things always made him feel nauseous. He hoped it wouldn’t take too long to coax his prisoner into complying, but soul demons and compliance didn’t go hand in hand. Almost as if it was reading Diego’s mind, the creature hissed at him before switching back into its human looking form, shooting him a contemptuous look and licking its lips. Diego’s hands tightened into fists. Settling scores wasn’t a storm rider trait, but if this was the creature that destroyed his life all those years ago, it would not be leaving Storm Lands alive. Oooh, so there it is. The first few opening chapters of my new debut novel, Mask of the Gods. What do you think? Are you intrigued? Do you want to know more? If you do, then you should definitely sign up for my updates on the right hand side of this page, or follow me on social media to find out more about the world I have created. Or you could just grab your very own copy using the buttons below. 1. Access to free short stories. 2. Advanced reader copies (ARC's) of forthcoming releases. 3. Updates on my WIP's & new releases.